Mangaluru, July 31, 2016: As per reports, UGC, University Grants Commission has sanctioned Rs. 1.5 crore to more than the century-old University College at Hampankatta here, a constituent college of Mangalore University, under CPE, college with potential for excellence scheme. This will enable the college to use the fund for infrastructure development and skill development programmes. The status will be valid from April 1, 2016 to March 31, 2021. In its July 22 letter to college principal Udaya Kumar Irvathur, the UGC has specified the categories for which the college could spend the amount. The college could use the amount for upgrading laboratories, procuring teaching aids, library automation, purchasing computers, books and journals, to have Internet connectivity, and upgrading class rooms and seminar halls. Of the amount released, Rs. 10 lakh has been earmarked for conducting skill development programmes. According to the letter, the college could also use the fund for maintaining equipment and “enrichment of teachers”, and to purchase laboratory consumables. Special heritage status : The UGC also bestowed the ‘special heritage status’ on the college sometime ago, the only degree college in Karnataka to get it. It sanctioned Rs. 1.83 crore under the scheme for the renovation of its Ravindra Kala Bhawan. According to Mr. Iravathur, the UGC has released half of the sanctioned amount. The building committee of the university has approved the works proposed and is now awaiting the nod of the Syndicate. 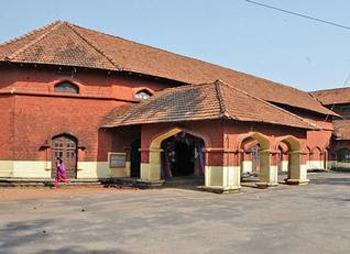 The college, now accredited with A grade from the NAAC, has three heritage buildings built with laterite stones and wooden trusses. Buildings have pitched roofs with Mangalore tile cladding. Walls have a traditional red colour. Front portion of corridors have Gothic style arches. The college was started as a provincial school in 1868 by a nine-member committee with an endowment of Rs. 65,000. It was designated as the Government College, Mangalore, in 1879 and FA, Fellow of Arts course was introduced.